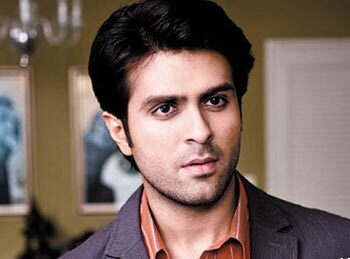 Harman Baweja was all set to be the next Bollywood star. But a dismal debut, Love Story 2050, crashed his hopes of becoming an overnight sensation. His next release Victory sank his career even further despite starring popular cricketers from around the world. Ashutosh Gowariker's What's Your Raashee might just be the card to lift Harman's career, and finally set him on the high road to success. He tells us about his new film, and his co-star and alleged ex-girlfriend Priyanka Chopra. What was your first reaction when Ashutosh Gowariker asked you to work in his film? Ashu sir had seen the rushes of Love Story 2050 before it released. He gave me a call and I met him. He had a project in mind. I met him a couple of times. He told me he was making a film on What's Your Raashee much later, and said you're on. I asked him to hold on, covered the phone receiver with my hand, and yelled my lungs out! For someone like me to get to work with Ashu sir -- a senior director -- so early in my career is an honour. Were you apprehensive after hearing that Priyanka had 12 roles in the film? The story is about Yogesh Patel, who lives in Chicago, studies at the University of Chicago and works there. He comes to Mumbai, and is bound by circumstances to get married in 10 days. He meets a girl from each raashee and in the process, he evolves as a character. When I heard that Priyanka will play 12 roles, it made me happy that she would get the opportunity to prove her acting prowess with a director who can handle a script like this. I was sure Ashu sir would do justice to the characters, as I have seen his work as an director. What kind of director is Gowariker? Is he a taskmaster? Not really. Because of the cinema he has done like Lagaan, Swades and Jodhaa Akbar, you would probably think he is a very serious person. He is serious when he comes to work and is extremely disciplined. But the closest reflection of his personality would be a film like What's Your Raashee because he's a very funny person. He has poker face humour. He is very relaxed on the sets. He is not bossy, he gives you space. He is open to suggestions. You can ask him anything about the film or scene and he will answer it. Were you nervous when you first met him on the sets? Yes. That was natural. I think I will be nervous working with any director on the first day because it is a new environment. But the advantage was that I had met him at least 20 times before we started shooting. I had spent hours chatting with him. What was working with Priyanka like? I have known Priyanka for more than six years. We share a great rapport. Everything was new when we were shooting for Love Story 2050. There was a lot of nervous energy in me then. But What's Your Raashee was not a home production. I was just doing the job of an actor so I was more relaxed. But Priyanka had 12 parts to play, so she was constantly stressed. The fact that we knew each other helped a lot. Among the 12 raashee stories, which one was the most complicated? Aries. Anjali is the first girl I meet. I don't know how to talk to a girl. Plus, you tend to have a dream girl in mind and here, you've come for an arranged marriage. I don't know what conversation to have, so there's some amount of discomfort. Also, Anjali is very different. There was a lot of pressure on me while acting this story. I have many emotions during the story too. It starts on a funny note, and then becomes emotional. It may seem like a normal hilarious scene but it has many layers. You are a Scorpion in real life, like your character Yogesh. How similar is Yogesh to you? We are similar in many ways. When I was reading the script, I told Ashu sir that some of Yogesh's dialogues are what I would usually say. Also, I have studied in the University of California, so I can relate to studying abroad, making ends meet, doing a part-time job. Yogesh is respectful even if someone means harm to him. He is very humble. I have these qualities too. If you could marry any of the 12 girls in reality, whom would you choose? That's tough. I don't think any guy should be given 12 options, especially when it comes to girls. Guys get confused with just two girls in their life! But if I got to know Hansa (Cancer) better, I would want to be with her. I could connect to Sanjana (Aquarius) and Kajal (Gemini) instantly. If I knew the essence of Vishaka (Taurus), she would be a great choice. Dr Puja Goradia (Virgo) is beautiful. It's very difficult for me to choose. At the end of the day, all of them are played by Priyanka. So the safest answer would be her. Since Priyanka has so many get-ups in the film, waiting for her on the sets must have been boring. I'm not the type to return to the (makeup) van and come out only for my shots. I'm on the sets from the time I'm ready to pack-up. Plus, I had to be patient knowing that Priyanka was struggling in the van, getting into her next character. So I was supportive. I did not get irritated with the wait. In the song Manuga Manuga, you dance like a robot and a girl dominates you. Do you think such girls exist? Yes. I know many girls who will relate to the song, and that it's exactly the kind of life they would want to lead. But that also comes from the fact that women have been suppressed in the past and things have changed now. It evolves from there. I think it is justified, to some extent, if they feel they want to dominate men. I hope I don't end up like Yogesh. But some of my friends are going that. How upset were you when Love Story 2050 didn't do well? A lot went into the making of that film. It received its share of badgering. People just pounced on that film and made it look like we had committed a crime. But that's part of the game. When people expect and you don't deliver, you have to listen to a lot. It affected me emotionally because I was totally involved with the film. It was my first film and meant a lot to me. But it only motivated to me to work harder. During the same time, there were rumours about your link-up and break-up with Priyanka. How did that effect you? Honestly, the link-up and break-up did not take a toll on me professionally. When I walk into the sets, I become Yogesh Patel. I do my job as an actor. Off the sets, I am Harman again. They have made Priyanka and I break up and patch up six times by now! You get used to that after a period of time. But I won't say I am immune to it. I have a film It's My Life directed by Anees Bazmee. It is produced by Boney Kapoor and stars Genelia and Nana Patekar.